Like its neighbor, San Miguel, San Jose Del Vado (St. Joseph of the Ford), was originally part of the San Miguel del Vado Land Grant in 1794. This was one of many colonial towns that the Spanish created to serve as buffer zones against hostile Indian raids. 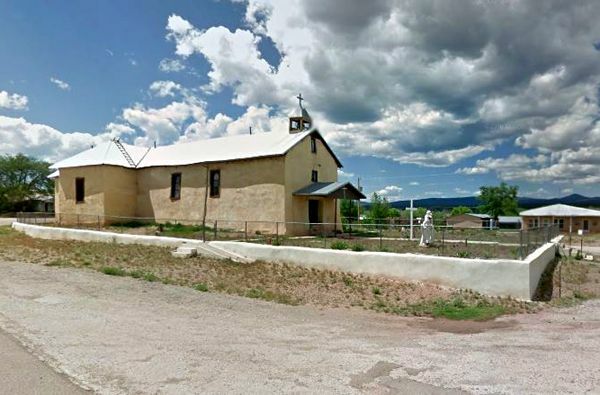 After the community of San Miguel was settled in 1794, the original colonists and others arriving from Santa Fe next established the community of San Jose on the west bank of the Pecos River about 28 miles southwest of Las Vegas. The community was first settled by Spanish military personnel and the Genízaro colony of Santa Fe. 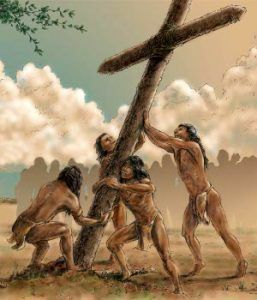 Genizaros were Indians that did not belong to any tribe; having been captured and sold by the Spanish, educated as Christians, and, consequently ostracized from their own tribes. When the Genizaros became unruly in Santa Fe, Governor Fernando Chacon appointed Don Luis Maria Cabeza de Baca to settle them in the Pecos River Valley. The residents were joined by Indians of other pueblos, including the more progressive Pecos Indians, who entered into a genízaro status and thus contributed to the depopulation of the Pecos Pueblo. The original adobe homes were built closely together around a square, which could be closed for defense in times of Indian raids. In March 1803, nine years after the founding of San Jose, Pedro Rautista Pino, acting on orders of the governor, partitioned the land to the 47 heads of households of San Jose. After the establishment of the Santa Fe Trail in 1821, San Jose became one of the many stops along the trail in the Pecos River Valley. In May 1826, permission was granted, by the Bishop of Durango, to erect a church at San Jose. San Jose was under the jurisdiction of Nuestra Senora de los Angeles church at the Pecos Pueblo until nearby San Miguel Del Vado was made a parish and provided with a priest. In 1846, during the Mexican-American War, San Jose was chosen as a camping site by General Stephen Kearny as he made his way through the area proclaiming the American occupation of New Mexico. The same year, a passenger stagecoach service was established between Independence, Missouri and Santa Fe. The stagecoach route, which crossed the Pecos River ford at San Jose, had regular mail service by 1849, and daily passenger service by 1862. The stagecoach station was probably located in the southeast corner of the plaza. As a result of the trade caravans and stagecoaches traveling along the trail, San Jose prospered and grew in population. This traffic became more important after the settlement of Las Vegas, as caravans began to bypass San Miguel, and traveling a shorter route directly to San Jose. In 1858, a post office was established in San Jose, which has been in operation, intermittently, from its establishment to the present. In 1879, the construction of the Atchison, Topeka and Santa Fe Railroad began in New Mexico. Once completed, the railroad bypassed San Jose, and traffic along the Santa Fe Trail all but ended. A steady decline in San Jose’s population followed. The village abandonment was further aggravated by the federal government land surveys of the early 20th century which assigned the common lands of the original land grant to federal jurisdiction and were then fenced in; greatly reducing the public grazing lands. At that time, stock breeders were forced to search elsewhere for adequate grazing land for their cattle and sheep or abandon this form of livelihood. Route 66 made its way through the village in 1926, probably stimulating the economy. However, it was short-lived and rerouted in 1937. Later when the highway was replaced by U.S. 85 and I-25, the highways bypassed the town. 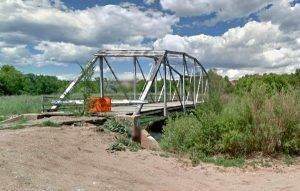 An old Route 66 era steel truss bridge sits abandoned at the end of County Road B41D. Near the old bridge was the original Santa Fe Trail crossing of the Pecos River. The population of San Jose today is about 140 people. San Jose is located south of I-25. To access the town, take exit 323 and travel west on the north frontage road for about two miles, and turn south onto County Road B41D, and travel about a half a mile to San Jose. As you continue your journey westward, return to I-25 to make your way to Rowe, some 14.5 miles to the northwest. 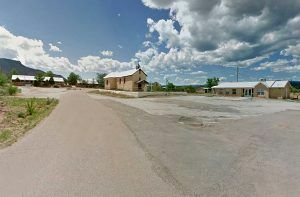 Along the way, there is an exit for Sands, which was once the site of a railroad station and now boasts a large modern convenience store called the Pecos River Station if you need a break. There is little else here except for a few scattered homes. Four miles to the west on the south frontage road, maps show another town called Ilfield that was also a stop on the railroad. There is nothing here but a few homes. Six miles to the west of Ilfield, maps also show a town called Pajarita which is only accessible from the south frontage road. From here, a dirt road called Camino Pajarita moves under I-25 to ranch lands on the north side of I-25.